So while the famed chandelier of the Paris Opera House in Cameron Mackintosh’s new touring production now at the Boston Opera House doesn’t do quite as many tricks as it did in the earlier production, this version also doesn’t feel quite as unwieldy as the earlier incarnation did at times. And the essential elements of the theatrical icon that has been running for 30 years in London, and 29 years on Broadway, with no end in sight, are all still here, including stunning costumes and sets, stirring melodies, and great voices to sing them. Producer Mackintosh created this new production in association with with Lloyd Webber’s Really Useful Group, and it has been touring the world for four years now. It has given the original production a shave and a haircut, trimming a bit here and there, and includes new sets by Paul Brown. The storyline based on the classic novel “Le Fantôme de L’Opéra” by Gaston Leroux should be familiar to all by now. The Phantom is a horribly disfigured, masked man who lurks beneath the catacombs of the Paris Opera House, conducting a reign of terror over all who inhabit it. He falls madly in love with an innocent young soprano, Christine Dae, and devotes himself to creating a new star by nurturing her extraordinary talents and by employing all of the devious methods at his command. Derrick Davis is the third African-American to take on the role of The Phantom and the first to play him in a touring production, and he has the requisite voice and charisma to portray the mysterious figure, appearing and disappearing at a moment’s notice. He is now less the disfigured madman, and more the misunderstood teacher. Eva Tavares is the lovely, gifted Christine, torn between her lessons from her “angel of music” and her love for her childhood friend Raoul, the Vicomte de Chagney (Jordan Craig). Two and a half hours of murderous mayhem would be too much so the book by Lloyd Webber and Richard Stilgoe provides comic relief in the form of theater owners Firmin (David Benoit) and Andre (Edward Staudenmayer), as well as temperamental diva Carlotta Giudicelli (Trista Moldovan) and hefty, haughty tenor Ubaldo Piangi (Phumzile Sojola). Macintosh and Lloyd Webber made the wise decision to kept the late Maria Bjornson’s grand, glorious costumes, which make the second act opener “Masquerade/Why so Silent?” so spectacular. Scott Ambler’s choreography includes the staging of several snippets of grand opera itself and ballet, as the “theater within the theater” theme at times turns the Boston Opera House into the Paris Opera House. “The Phantom” has always been a grand theatrical spectacle, and that it remains. You can see the cost of your ticket is right up there on the stage with the company of 29 actors. 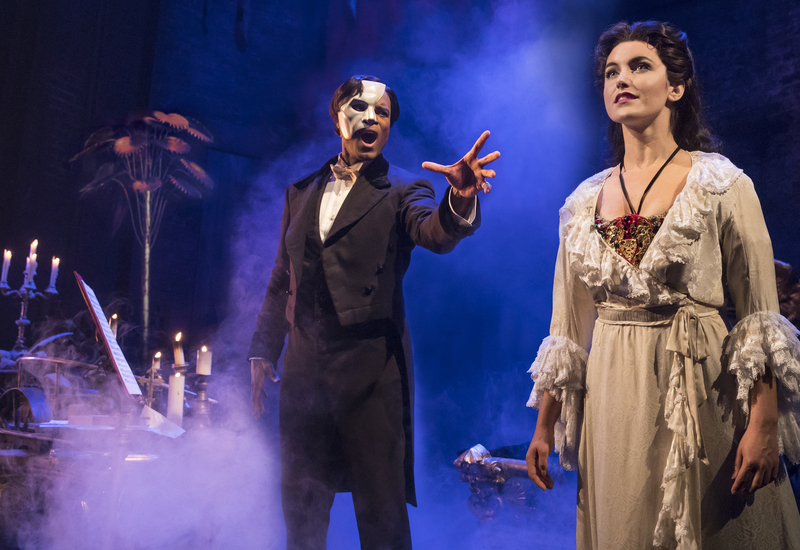 Cameron Mackintosh in association with the Really Useful Group presents the new production of “The Phantom of the Opera.” Music by Andrew Lloyd Webber. Lyrics by Charles Hart. Additional lyrics by Richard Stilgoe. Book by Richard Stilgoe and Andrew Lloyd Webber based on “Le Fantôme de L’Opéra” by Gaston Leroux. Directed by Laurence Conner. At the Boston Opera House through Oct. 1. Broadwayinboston.com. The Company performs “Masquerade ” in “The Phantom of the Opera.” Photo by Alastair Muir.